Robles, G.; Fresno, J.M. ; Martínez-Tarifa, J.M. Radio-Frequency Localization of Multiple Partial Discharges Sources with Two Receivers. Sensors 2018, 18, 1410. Abstract—Spatial localization of emitting sources is especially interesting in different fields of application. The focus of an earthquake, the determination of cracks in solid structures, or the position of bones inside a body are some examples of the use of multilateration techniques applied to acoustic and vibratory signals. Radar, GPS and wireless sensors networks location are based on radiofrequency emissions and the techniques are the same as in the case of acoustic emissions. This paper is focused on the determination of the position of sources of partial discharges in electrical insulation for maintenance based on the condition of the electrical equipment. The use of this phenomenon is a mere example of the capabilities of the proposed method but it is very representative because the emission can be electromagnetic in the VHF and UHF ranges or acoustic. This paper presents a method to locate more than one source in space with only two receivers, one of them in a fixed position and the other describing a circumference around the first one. The signals arriving from the different sources to the antennas are first separated using a classification technique based on their spectral components. Then, the individualized time differences of arrival (TDOA) from the sources collected at different angles describe a function, angle versus TDOA, that has all the geometric information needed to locate the source. The paper will show how to derive these functions for any source analytically with the position of the source as unknown parameters. Then, it will be demonstrated that it is possible to fit the curve with experimental measurements of the TDOA to obtain the parameters of the position of each source. Finally, the technique is extended to the localization of the emitter in three dimensions. Robles, G.; Fresno, J.M. ; Martínez-Tarifa, J.M. ; Ardila-Rey, J.A. ; Parrado-Hernández, E. Partial Discharge Spectral Characterization in HF, VHF and UHF Bands Using Particle Swarm Optimization. Sensors 2018, 18, 746. Abstract— The measurement of partial discharge (PD) signals in the radio-frequency (RF) range has gained popularity among utilities and specialized monitoring companies in recent years. Unfortunately, in most of the occasions the data are hidden by noise and coupled interferences that hinder their interpretation and renders them useless especially in acquisition systems in the UHF band where the signals of interest are weak. 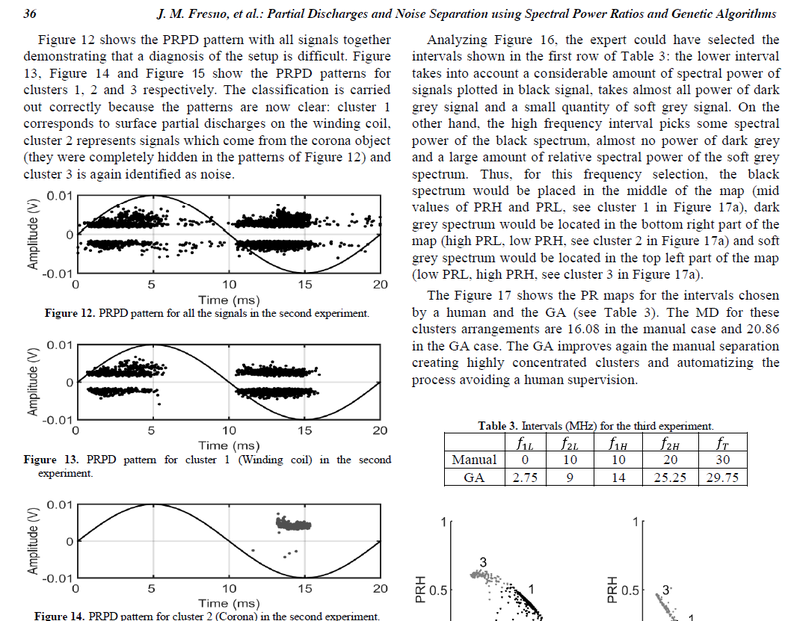 This paper is focused on a method that uses a selective spectral signal characterization to feature each signal, type of partial discharge or interferences/noise, with the power contained in the most representative frequency bands. The technique can be considered as a dimensionality reduction problem where all the energy information contained in the frequency components is condensed in a reduced number of UHF or HF/VHF bands. In general, dimensionality reduction methods make the interpretation of results a difficult task because the inherent physical nature of the signal is lost in the process. The proposed selective spectral characterization is a preprocessing tool that facilitates further main processing. The starting point is a clustering of signals that could form the core of a partial discharge monitoring system. Therefore, the dimensionality reduction technique should find out the best frequency bands to enhance the affinity between signals in the same cluster and the differences between signals in different clusters. This is done maximizing the minimum Mahalanobis distance between clusters using particle swarm optimization (PSO). The tool is tested with three sets of experimental signals to demonstrate its capabilities in separating noise and partial discharges with low signal-to-noise ratio and separating different types of partial discharges measured in the UHF and HF/VHF bands. Fresno, J.M. ; Robles, G.; Martínez-Tarifa, J.M. ; Stewart, B.G. Survey on the Performance of Source Localization Algorithms. Sensors 2017, 17(11), 2666. Abstract— The localization of emitters using an array of sensors or antennas is a prevalent issue approached in several applications. There exist different techniques for source localization, which can be classified into multilateration, received signal strength (RSS) and proximity methods. The performance of multilateration techniques relies on measured time variables: the time of flight (ToF) of the emission from the emitter to the sensor, the time differences of arrival (TDoA) of the emission between sensors and the pseudo-time of flight (pToF) of the emission to the sensors. The multilateration algorithms presented and compared in this paper can be classified as iterative and non-iterative methods. Both standard least squares (SLS) and hyperbolic least squares (HLS) are iterative and based on the Newton–Raphson technique to solve the non-linear equation system. The metaheuristic technique particle swarm optimization (PSO) used for source localisation is also studied. This optimization technique estimates the source position as the optimum of an objective function based on HLS and is also iterative in nature. Three non-iterative algorithms, namely the hyperbolic positioning algorithms (HPA), the maximum likelihood estimator (MLE) and Bancroft algorithm, are also presented. A non-iterative combined algorithm, MLE-HLS, based on MLE and HLS, is further proposed in this paper. The performance of all algorithms is analysed and compared in terms of accuracy in the localization of the position of the emitter and in terms of computational time. The analysis is also undertaken with three different sensor layouts since the positions of the sensors affect the localization; several source positions are also evaluated to make the comparison more robust. The analysis is carried out using theoretical time differences, as well as including errors due to the effect of digital sampling of the time variables. It is shown that the most balanced algorithm, yielding better results than the other algorithms in terms of accuracy and short computational time, is the combined MLE-HLS algorithm. This paper is open access and can be dowloaded here. Boya, C.; Robles, G.; Parrado-Hernández, E.; Ruiz-Llata, M. Detection of Partial Discharge Sources Using UHF Sensors and Blind Signal Separation. Sensors 2017, 17(11), 2625. Abstract— The measurement of the emitted electromagnetic energy in the UHF region of the spectrum allows the detection of partial discharges and, thus, the on-line monitoring of the condition of the insulation of electrical equipment. Unfortunately, determining the affected asset is difficult when there are several simultaneous insulation defects. This paper proposes the use of an independent component analysis (ICA) algorithm to separate the signals coming from different partial discharge (PD) sources. The performance of the algorithm has been tested using UHF signals generated by test objects. The results are validated by two automatic classification techniques: support vector machines and similarity with class mean. Both methods corroborate the suitability of the algorithm to separate the signals emitted by each PD source even when they are generated by the same type of insulation defect. M.V. Rojas-Moreno, G. Robles, R. Albarracín, J.A. Ardila-Rey, J.M. Martínez-Tarifa, Study on the self-integration of a Rogowski coil used in the measurement of partial discharges pulses. Electrical Engineering. September 2017 , Volume 99, Issue 3, pp 817–826. Abstract – The maintenance of high-voltage power systems requires the determination of the amplitude and waveforms of fast current pulses that commonly occur in electric equipment. These high-frequency pulses may arise from different sources such as lightning strikes, electrical arcs and post-arc phenomena, switching operations of circuit breakers and gas-insulated switchgears, electromagnetic pulses and partial discharges. 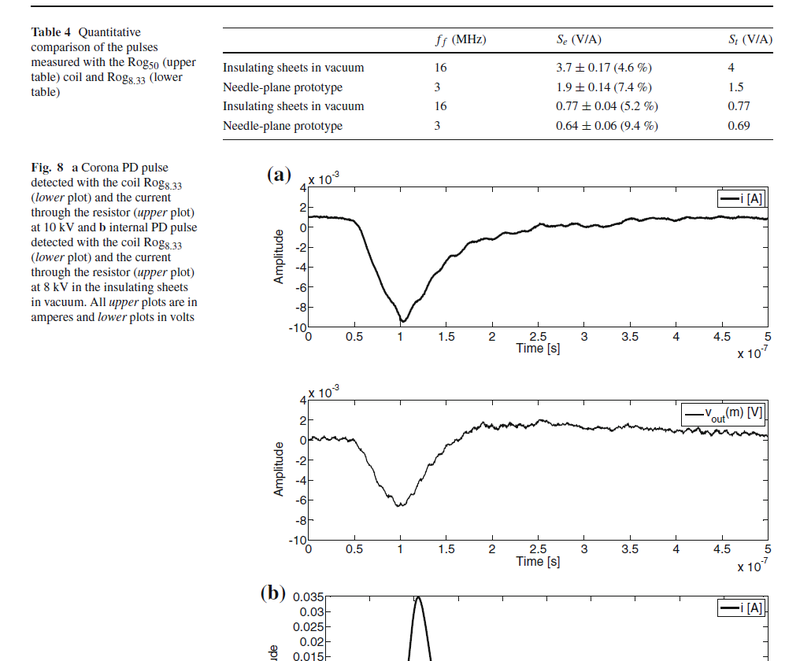 This paper is a step forward in the modelling of the Rogowski coils, which are commonly used to measure these pulses. This study was performed by means of a simplified model based on lumped electrical parameters. The model was simulated in Simulink and validated by measuring Partial Discharges (PD) in two different electrical insulation systems. The validation corroborates that the electrical model can be used to study the time and frequency responses of Rogowski coils with different number of turns and dimensions to obtain a configuration that fits the needs of the designer concerning the type of pulses that she/he wishes to measure. Keywords – Rogowski coil, High-frequency pulses, Partial discharges, self-integration.